Last week I had a had the honor or speaking with Madeleine Stowe, actress and MS spokesperson for the "Lights, Camera, Take Action On MS" campaign with Genzyme. Madeleine made be better known to some of you as Victoria Grayson on ABC's popular tv show Revenge! When Genzyme asked if I wanted to interview Madeleine on the phone to learn more about this event I was a bit shocked. . . me?! Really? What a cool opportunity, of course I want to interview Madeleine! She was so nice to talk to and so honest about her experiences growing up with her father who had MS. 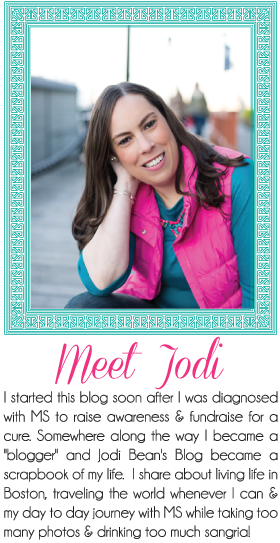 I think it is amazing that she is sharing such a personal part of her life and I love that she is an MS Activist! In talking with Madeleine I learned that her father was diagnosed with MS prior to their being any disease modifying treatments and that his disease progressed rapidly. She shared that she has vivid memories of her childhood and while she didn't know anything different she remembers feeling a sense of guilt. Madeleine's father died in 1983 and while there wasn't a lot of hope for him during his life with MS there is SO much hope for people being diagnosed and living with MS today. That is what motivates Madeleine to be involved with these events today. She shared that whole families are coming, not just people with MS. She loves talking to the family members and caregivers too. In addition to talking to Madeleine on the phone, Dr. Crayton, a neurologist in the DC area who will be speaking at the upcoming event in Las Vegas with Madeleine was also on the call. Dr. Crayton shared that community events like this are important to attend. She feels it is very important to "take action on MS" because incorporating other alternates to medications like massage, yoga, acupuncture, etc. are just as important. She talked about how she has so many patients who are managing their MS well and how MS really has changed so much since the days when Madeleine's father lived with it, thanks to treatment options. Really at one point the three of us where chatting away like old friends! It was pretty funny how something like having a connection to MS in common (although all three of us for different reasons) can really connect you! I love that. After about 30 minutes or so we wrapped up our call and I felt so inspired to know that there two more amazing ladies advocating for MS! A little more about the events. . . according to Genzyme, the goal of the events is to raise awareness of how to take action on MS by helping people learn more about topics ranging from managing stress to the physical and emotional aspects of living with the disease. Attendees will have the opportunity to meet Madeleine, hear more about her story, and learn from MS experts. So far the events have taken place in Chicago, Orlando and Houston and they were so successful that three more cities have been added for June. Next up are Pittsburgh, Las Vegas and Atlanta! Go here to see specific dates and to register. Visit TakeActionMS.com to see video highlights from attendees at previous events, who shared how and why they take action. Who knows. . . maybe I'll get to attend a future event and give you a first person report about how amazing I hear they are! Or fingers crossed, Lights, Camera, Take Action On MS will come to Boston! If you attend one of the June events please let me know what you think! This is not a sponsored post. I am not being paid to write this post. All opinions are my own. I was just grateful for the opportunity to speak with Madeleine and Dr. Crayton and to learn more about this event. I do not take a medication made by Genzyme nor do I have any affiliation with them. Last week I had the opportunity to attend the annual MS Milestones Gala in Boston. I've been once before and was excited to attend again. My friend Doug (pictured below with his wife Gretchen) had a table through his employer and need some seat fillers. Katelyn and I were happy to do the job! It isn't very often that I get to go to a fancy event for free! My date! Not sure why the flash wasn't on for our photo but it was for Gretchen and Doug's? I wish it had been b/c theirs came out so much better! There was a cocktail hour with silent auction before the dinner. We got a good laugh at this sports package with an autographed football by Tom Brady! The dinner included a program with Dr. Philip DeJager from Brigham and Women's MS Center being honored for his work and research in MS.
After the gala we stopped at the hotel bar for one more drink and I got to catch up with my friend Stacy from Fashion Plates who also is in charge of the Gala! She did a great job of course. It was a fun night out and I even ran into some old friends (I use to babysit their kids). I hadn't seen them in over ten years probably! Happy Friday! I hope everyone has a great weekend. I'm hoping to finally kick my cold to the curb! I know it is hard to believe. . . I have a hard time believing it myself but last weekend I went to my 20th high school reunion! I feel like high school reunions have lost some of the appeal now that we have Facebook and can keep up with what everyone is doing. On the other hand this was our first official reunion which made it kind of exciting! I went with one of my oldest friends, Jill (standing next to me in above photo). She had a few people over her house before hand. We all know you can't go to a reunion without having a glass or two of wine first! Ha! Let it be said. . . if I'm being honest. . . all the girls looked pretty much the save if not better but the guys. . . wow! The guys had all changed so much. Many were bald which made them unrecognizable!!!! A fellow classmate took a lot of photos throughout the night which was great since I didn't take any! It was fun catching up with old friends and the four hour event flew by! There was a photo booth and props too! We had fun taking some goofy pics in there! Not sure when/if there will be another high school reunion for my class or it I would even want to go but I'm glad I went to this one! Out of my class of 200 people I think there were about 70 people there so not so bad! Have you been to a high school reunion? Was it awkward or awesome?! Linking up for Thoughts for Thursday with Annie and Natalie. Today is World MS Day! In the US we celebrate MS Awareness Week in March but in addition, World MS Day started in 2009 to bring the global community together to raise awareness worldwide! More than 2.3 million people worldwide live with MS. The number of people in the US living with MS is unknown since the CDC does not require reporting (source). 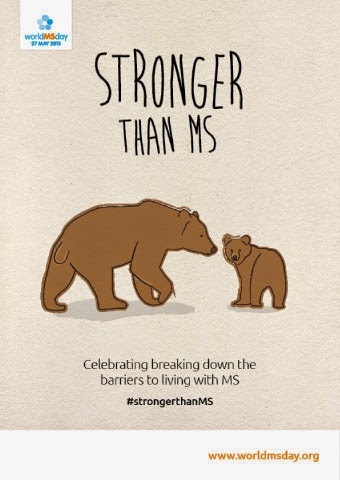 The hashtag for this year is #strongerthanMS which I just LOVE! Now let's get to What I'm Loving Wednesday. . . I'm loving these tiny dancers! My nieces danced in their recital this weekend and they did great! 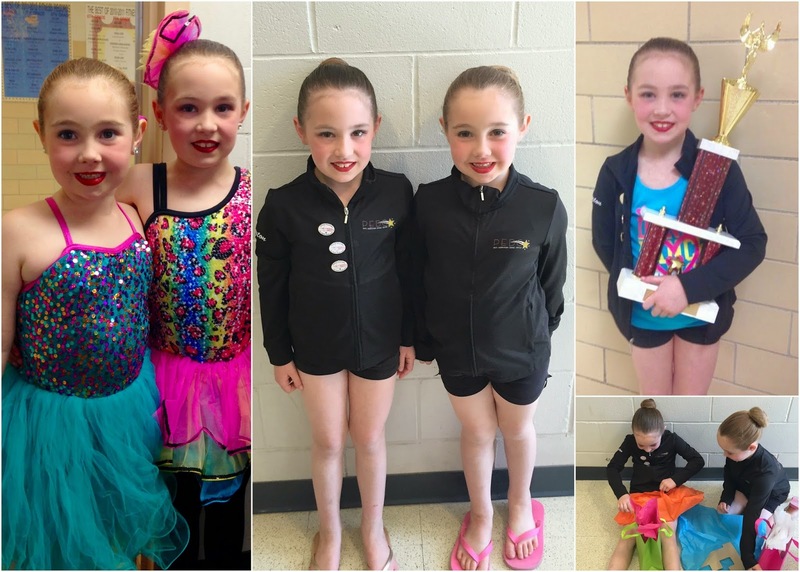 They are both on a competiton team and are doing so well. It is so fun to see how much they have improved. Peyton has been dancing for 5 years so she got a trophy! I gave them some crafts (instead of flowers). I'm loving the Red Nose Day was last week and that so many people got involved. The poverty in this country that some children live in is unacceptable considering how much money/resources the United States has. . . I hope this day helped to raise a lot of awareness and money! I'm loving that after a lot of "tire drama" I finally have 4 brand new tires. I've had several cars in my lifetime and had never had a flat before this car. This was my 2nd and my car isn't even 2 years old yet. Ugh! Hopefully these new tires will bring much better luck. I'm loving that Z-packs work so fast! I had a sinus infection last week and I'm finally feeling better. I really thought that it was allergies and MS fatigue from Ride The Vineyard and those two things were probably both factors in me getting sick but good to know it was actually something that could be treated with meds (and essential oils - thankful for those b/c they helped a lot while I was waiting for my antibiotic)! I'm loving all 3 of these funnies! I'm not usually one to share these types of things but I just couldn't resist! They all gave me a good laugh! Two weeks ago I attended Emily and Joe's wedding in Boston. It was a beautiful day which was surprising after the unspringy April we had. They got married at a beautiful Catholic Church in Newton (for you local folks) and then had their reception at the historic Omni Parker House! It was a classy affair with lots of good times mixed in! Yes she had 10 bridesmaids! There were also 10 groomsmen, 3 flower girls and 2 ring bearers! They have a lot of friends/family! Ha! The new Mrs. and Mrs. Foley as they walk down the church! You know now that I think of it I don't know if the priest ever did the whole "You may now kiss the bride. . ."
A few of you asked how I ended up "styling" my dress for the wedding. I had really wanted to find a pair of statement earrings that were a pop of color but unfortunately I didn't find any (with the limited time I had to shop). So I borrowed these earrings and this bracelet from my cousin Katelyn (who was a former Stella and Dot stylist). I really like the way they looked with the lace on the dress! The first dance! The ballroom at the Omni Parker House is gorgeous and it was the perfect place to celebrate Emily and Joe! We had such a nice time dancing and drinking the night away! I'm so happy for Emily and Joe! They have moved to DC and I miss Emily already after having her here in Boston for our entire friendship! I see a trip to DC in my near future!! !